The workshop is in session. The Department of Art Research, Archives and Information Systems held their 8th workshop on January 29th, 2019, and gave presentations on the following two subjects. 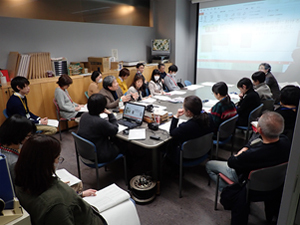 This seminar was related to Exhibition “Making notes of Japanese Art History―The research notes of Aimi Kōu, Tanaka Ichimatsu, and Doi Tsugiyoshi,” which was held at Jissen Women’s University’s Kosetsu Memorial Museum and Kyoto Institute of Technology’s Museum and Archives from May through August 2018 (cf. our May 2018 monthly report), and we also unveiled additional materials that were discovered after the exhibition. 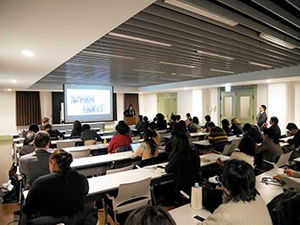 This seminar attracted many researchers from inside and outside Tokyo National Research Institute for Cultural Properties and lively discussions were held from a variety of angles. 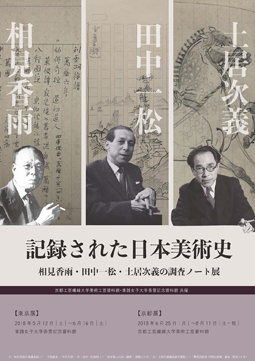 Both Ichimatsu Tanaka and Tsugiyoshi Doi were researchers who built the foundation for research into Japanese art history, authored a large number of books and chalked up a substantial track record, and their records, which underpinned their research, and the materials they collected must be better assembled in the form of an archive. We will organize the staggering amount and variety of analogue materials by leveraging digital features in a bid to create an archive of cultural properties that will contribute to a wider range of research down the road. Although there are innumerable libraries in the world including Japan, the United States and European countries have art libraries which specialize in art books and materials. Every two years, these countries hold an international conference for art libraries. 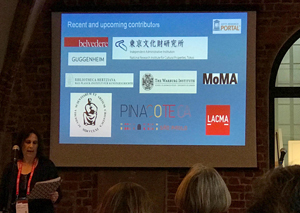 During the 8th International Conference of Art Libraries held at the National Museum (Rijksmuseum) in Amsterdam, the Netherlands on October 4th and 5th, 2018, we made an oral presentation titled “The Contribution of the Tokyo National Research Institute for Cultural Properties: Art Bibliography in Japan for OCLC Central Index.” The Institute has been collecting information on art exhibitions held in Japan, including literature-based information found in exhibition catalogues. We have provided data on approximately 50,000 items of literature appearing in exhibition catalogues from 1930 to 2013 to the OCLC Central Index. Although these Japanese art exhibition catalogues are highly specialized, they have had insufficient results in providing the public useful information compared to general magazines and papers. This initiative has resulted in offering OCLC users of the world new chances to find required materials. This conference is operated mainly by European countries and the United States, but after the presentation, we received feedback that this initiative in Asia is important to reinforce international cooperation among the art libraries. We have been continually providing this kind of information in the OCLC Central Index. Recently, we offered approximately 2,800 items of literature-based information published in 2014. We are going to add additional literature data from 2015 by the end of 2018. Tokyo National Research Institute for Cultural Properties has been promoting a joint research project with the Getty Research Institute in the United States. 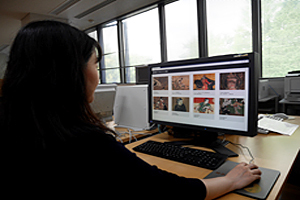 On May 2017, the digital data of exhibition catalogues and art magazines published during the Meiji period that are controlled by the Institute became searchable and accessible on the Getty Research Portal (GRP). We became the first contributor of such data in Asia. The digital data of the “Year Book of Japanese Art” was published in 70 issues by the Institute from 1936 to 2013. “Bijutsu Kenkyu (Journal of Art Studies)” (the 1st issue to the 419th issue) and “Science for Conservation” (the 1st issue to the 57th issue) have also become searchable and accessible on the GRP. As a result, the total number of titles provided by the Institute is over 636. Although these publications were accessible from our website (Tobunken Research Collections: http://www.tobunken.go.jp/archives/; “Science for Conservation” in PDF: http://www.tobunken.go.jp/~ccr/pub/cosery_s/consery_s.html) and our repository (https://tobunken.repo.nii.ac.jp/), the searchability and accessibility of this data from the GRP that has numerous users in the world, through a virtual art library resulted in a drastic change. This initiative enhanced the potential of overseas countries accessing our achievements in the research of cultural properties. As part of this joint project between the two Institutes, we are currently digitalizing valuable information owned by the Institute such as the exposition and exhibition publications during the Meiji, Taisho, and Showa periods. We will also add these digitalized publications to the GRP by the end of June 2019. Tokyo National Research Institute for Cultural Properties collects the materials of its former researchers and utilizes them as research archives. 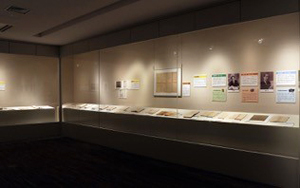 Approximately 70 items of the Tanaka Ichimatsu （1895 – 1983）archive, such as notebooks, records, and photographs, were displayed to the public for the first time in the exhibition “Making notes of Japanese Art History―The research notes of Aimi Kouu, Tanaka Ichimatsu, and Doi Tsugiyoshi” jointly held by Kosetsu Memorial Museum, Jissen Women’s University, and the Museum and Archives of Kyoto Institute of Technology. This exhibition gathers together the study notes of the three researchers who led Japanese art history from the Meiji period to the Showa period: Aimi Kouu（1874 – 1970）, Tanaka Ichimatsu, and Doi Tsugiyoshi（1906 – 91）. The exhibition allows visitors to experience how these predecessors of Japanese art history viewed and recorded the artworks they studied. Tanaka was skilled at drawing from childhood; his sketches of artworks throughout his life are excellent and suggest the importance of recording by hand, even in the current digital age. The exhibition was held at Jissen Women’s University in Tokyo between May 12th and June 16th, 2018, was visited by a total of 953 people for 32 days, and closed successfully. The exhibition is scheduled to be held at Kyoto Institute of Technology from June 25th to August 11th. Tokyo National Research Institute for Cultural Properties and the Tokyo National Museum (TNM) have jointly conducted optical research on Buddhist paintings in TNM’s collection. As part of this joint research, high-resolution photography with image dividing technique and analyses of coloring materials using X-ray fluorescence spectrometry were conducted on paintings of Kokuzo Bosatsu (Akashagarbha Bodhisattva) and Senju Kannon (Sahasrabhuja Avalokitesvara) from May 22nd to 23rd, 2018. These Buddhist paintings, which are representative of the later part of the Heian period, were produced with a particularly sophisticated aesthetic sense and a highly developed painting technique; the delicate and elegant depiction of their subjects is their most significant feature. Through this joint research on Buddhist paintings of the Heian period, high-definition color, near-infrared, and fluorescent images have been obtained. A comprehensive analysis of coloring materials using X-ray fluorescence spectrometry was carried out for the essential parts of the painting such as the subjects’ faces, bodies, clothes, accessories, belongings, and halos, as well as the canopies and backgrounds. The results of this analysis are not only beneficial for the understanding of each artwork but are important indicators for Japanese art history. After this, we will conduct further research, examine our results, and proceed to publish them as research materials. The Institute has been proceeding research studies of cultural properties in various ways and releasing the results. This time, the digital contents of Illustrated Handscroll of The Tale of Genji (The Tokugawa Art Museum), Birds and Flowers of Four Seasons Screens and The Western Kings on Horseback Screens (Suntory Museum of Art) have been produced and launched to open access in the Tobunken Library. Various images such as high resolution color images, X-ray images and near infrared images and analysis results of color materials by X-ray fluorescence spectrometer are on display on a dedicated terminal device. It is for academic and study purposes only and coping and printing are prohibited, but abundant information on the artworks utilizing the characteristics of digital images is available. In addition to those three artworks, nine artworks in all have been released such as The Eleven-Headed Kannon (Nara National Museum), The Hikone Screen (Hikone Castle Museum),Genre Figures said to be Honda Heihachiro Screen, Kabuki Performance Handscroll, Various Amusements known as the Sooji Byobu Screen (The Tokugawa Art Museum), and Red and White Plum Blossoms Screens (MOA Museum of Art). It is planned to add newly digital contents of other artworks and provide exclusive research materials. A display terminal is available for accessing the images and information during the opening hours of the Library. For more information about the Library, please see the Visitor’s Guide. 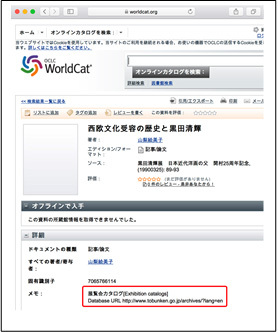 Screenshot of the literature published in an exhibition catalog after conducting a search on WorldCat. Tokyo National Research Institute for Cultural Properties endeavors to collect and utilize literature and materials on fine arts. To transmit information globally through the Online Computer Library Center, Inc. (OCLC), the world’s largest online library service provider, the Institute has proceeded with the project through repeated consultations with OCLC Center, Kinokuniya Company Ltd., its agent in Japan. As a result, in January 2018, approximately 50,000 items of data from articles and papers included in the exhibition catalogs were entered as “Tokyo National Research Institute for Cultural Properties, Art Bibliography in Japan” in the OCLC Central Index, the world’s largest corporative bibliographic catalog database. 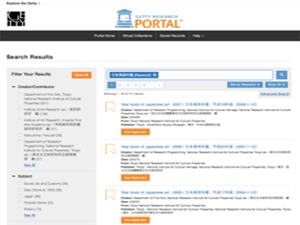 This contribution has allowed users to access bibliographic data on exhibition catalog papers including “Tokyo National Research Institute for Cultural Properties, Art Bibliography in Japan” by inputting any key words such as artists and works on fine art through search services such as WorldCat.org (https://www.worldcat.org/) and Art Discovery Group Catalogue (https://artdiscovery.net/). Published books and magazines can be accessed from general search engines or through library databases. However, articles and papers placed in exhibition catalogs that are highly specialized are not widely known. This time, reused data on articles and papers published in exhibition catalogs donated by art galleries and museums throughout Japan for the “Yearbook of Japanese Art” editing project that the Institute has been continually conducting since its early days, was provided. Although the function of accessing the entire text online from the search result directly has not been provided yet—an issue that needs to be solved—creating a possibility for discovery of any required materials for global internet users is of great significance. At this moment, the data accumulated from 1930 through 2013 were contributed, and the Institute will strengthen its information transmission by continually adding new data. This achievement is the result of the “project to formulate the basic grounds for sending information on cultural assets centered on fine arts and crafts both domestically and internationally,” a joint project that has been conducted with the National Museum of Western Art since 2016. 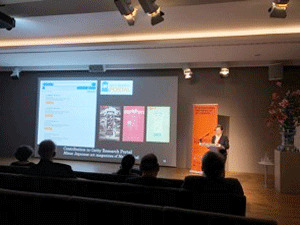 The Tokyo National Research Institute for Cultural Properties concluded an agreement with the Getty Research Institute on February 2016, concerning exchanges for researchers of both institutes and the collaboration on a project to make the digital information on Japanese art available on the Getty Research Portal. Research was commissioned by the Agency of Cultural Affairs, entitled “Research on the dissemination of Japanese art through inviting a foreign leading figure.” Thus, the Department of Art Research, Archives and Information Systems invited Ms. Kathleen Salomon, Associate Director of the Getty Research Institute to give a lecture and undertake inspections and meetings at art archives such as our institute, the Tokyo National Museum, the National Museum of Modern Art, Tokyo, the National Museum of Western Art, the National Art Center and the International Research Center for Japanese Studies in Kyoto. The seminar was held on December 6th, 2017, at the Kuroda Memorial Hall of the Tokyo National Museum. Ms. Salomon introduced the developments of and the current worldwide work of the Getty Research Institute and the library and spoke about the latest international trends in the information dissemination of art research materials. And then, Ms. Masako KAWAGUCHI from the National Museum of Western Art commented on the lecture, and the discussion as the chance of thinking the challenges and prospects regarding international information dissemination in Japan was hold with Emiko YAMANASHI, deputy director of Institute, as the chair. Forty-one people, —archivists from museums, librarians from universities and research organizations, researchers of art history and so on—participated in the seminar. The report of this seminar will be published as open access on our website in the near future. 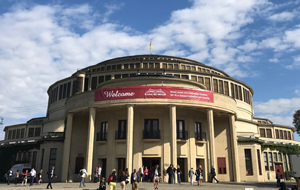 The International Federation of Library Associations and Institutions (IFLA) held its 83rd World Library and Information Congress from August 19 to 25, 2017 in Wroclaw, a city in western Poland. IFLA, founded in 1927 in Edinburgh, Scotland, is an international organization for libraries and a member of the International Committee of the Blue Shield. 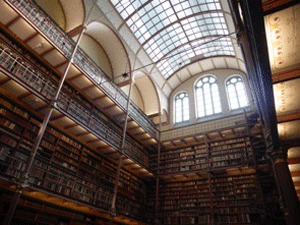 Headquartered in The Hague, the Netherlands, IFLA has approximately 1,400 member institutions from over 140 countries, and holds an annual world congress. At this year’s world congress, 248 sessions, including conferences, meetings and workshops, took place based on various topics and types of libraries such as national, academic and public libraries. As the first delegate from the Tokyo National Research Institute for Cultural Properties, I, Tomoko Emura from the Department of Art Research, Archives and Information Systems, participated in the Congress, joining workshops and meetings on art libraries and other topics relevant to our archives to share information and network with other participants from around the world. A session for the Art Libraries Section, Discovering Art and Architecture: Open-Access Tools for Art History Research, was held in the Museum of Architecture in Wroclaw on August 22, where four speakers from the Netherlands, Italy, the United States and Hungary presented various measures to expand the sharing of art-related documents and research materials to facilitate further studies. Ms. Kathleen Salomon from the Getty Research Institute explained, in her presentation titled A Virtual Library for Art History: The Getty Research Portal, that the Portal added our institute to the list of contributors in May this year and now provides access to digitized copies of the magazines and exhibition catalogues from the Meiji era owned by our institute. She also explained that other rare books in non-English languages are widely accessible from the Portal. Having seen no other participants from Japan or other Asian countries in the Art Libraries Section or the standing committee, I received the impression that international initiatives on art-related documents and materials are led by people in the U.S. and Europe, but also found that many Japanese artworks and documents are owned by institutions all over the world. Further, I realized that our institute would be able to play an instrumental role in supporting research activities and promoting a better understanding of Japanese culture more widely around the world by providing archive functions and information more effectively to the international community. Our challenge for the future is to foster international cooperation while maintaining our specialized expertise at a sufficient level. Numerous Japanese artworks can be found in European and American collections overseas. However, there are few conservators of these artworks overseas, and many of them cannot be shown to the public since they have not been properly conserved. Thus, the Institute conducts the Cooperative Program for the Conservation of Japanese Art Objects Overseas in order to properly conserve and exhibit these works. For three days from February 28th, 2017, KATO Masato, EMURA Tomoko and Won Hee Jae of the Japan Center for International Cooperation in Conservation visited and surveyed eleven Japanese paintings of nine works in the Grassi Museum for Ethnology in Leipzig. This museum houses around 200,000 pieces of fine art and craft, as well as folk materials, collected throughout the world except Europe. Of course, Japanese paintings, the historical value of which is high, are also included, such as the works previously owned by Dr. Heinrich Botho Scheube, who came to Japan as a foreign specialist employed by the government in the Meiji era, and paintings from Japan with a history of having been exhibited at the Third Paris International Exposition in 1878. The existence of these Japanese paintings has not been well known so far, but some are important works from the perspective of art history. Providing information obtained from this survey for the persons in charge of this museum, we expect it will be utilized for the appropriate conservation and management of these works. Based on the outcomes of this survey, we will proceed with the project by selecting the ones to be restored through consultation while considering the evaluation of the works in art history and the urgency of their restoration needs. The entrance lobby of the Institute on the 1st floor is used to introduce the results of research and projects. This time, the survey by the Japan Center for International Cooperation in Conservation is being publicized. The Center has conducted a survey on the Selected Conservation Techniques since 2014, in order to gather the information on each technique, its process, and the present problems. As a result of the survey, a calendar and a survey report have been published to share the information with the related organizations. This exhibition focuses on the Selected Conservation Techniques related to Urushi. Urushi trees used to be grown throughout Japan. However, as the amount of Urushi imported from overseas increased, the low price foreign Urushi spread out in Japan and today, the domestic Urushi accounts for only a few percent among all the Urushi distributed in Japan. In addition, since the whole Urushi industry declined due to the change of lives, the conservation and restoration of cultural properties using Urushi are facing a serious crisis. Makie, a decorative technique of Urushi, is an artifact that represents Japan, and there are a large number of Urushi objects kept in museums both within and outside Japan. We believe it is the duty of the Japanese to inherit the conservation and restoration techniques relating to Urushi. 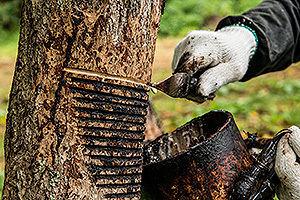 Today, several techniques related to Urushi are selected as the Selected Conservation Techniques by the Government; the technique to make the tools for tapping, the technique to tap the sap, the technique to refine the sap, the technique to make the filtrating paper and the technique to make the brushes for coating and Makie. The bearer or conservation body of each Technique is recognized under the Law. Every technique is highly specialized that needs to be surveyed and documented to disseminate information as well as to recognize the present issue on passing down these techniques. We hope this exhibition promotes the understanding of the techniques, materials and tools for the production and conservation of Urushi. A number of Japanese artworks can be found in European and American collections overseas. However, there are few conservators of these artworks overseas, and many of these works cannot be shown to the public since they have not been properly conserved. Thus the Institute conducts the Cooperative Program for the Conservation of Japanese Art Objects Overseas in order to properly conserve and exhibit these works. 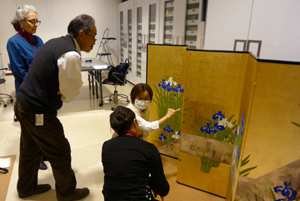 For three days from February 8th to 10th, 2016, EMURA Tomoko and ODA Momoko of the Japan Center for International Cooperation in Conservation visited and surveyed Japanese paintings in the Indianapolis Museum of Art. Ms. YAMAMOTO Noriko, Executive Director of the Association for Conservation of National Treasures, participated in this survey. The Indianapolis Museum of Art, established in 1883, is one of the largest museums in the United States and has over 54000 artworks from all over the world. Together with the curator of Asian Art, Dr. John Tadao Teramoto, and the senior conservator of paper, Ms. Claire L. Hoevel, we conducted our survey of 7 works of Japanese painting (11 objects total) that have some condition problems. The information gleaned from this survey will be shared with the staff of the museum so that these works can be conserved and managed. The artworks will be assessed in terms of art history, and based on the results of the survey, works in need of urgent conservation will be identified and candidates will be selected for conservation under the cooperative program. The Japan Center for International Cooperation in Conservation has been carrying out surveys of the selected preservation techniques that are indispensable for preservation of cultural properties. In this endeavor, a hearing survey on working processes, situation surrounding the work, and work-related social environment has been conducted targeting possessors and possessing groups of the selected preservation techniques and also photographing/recording of actual work sites and tools used for the work have been promoted. As a part of efforts to disclose the result of and disseminate information about this survey, the 2016 calendar for overseas was produced (available in two types: desk calendar and wall calendar). This calendar is titled “Traditional Japanese Technique to Conserve Cultural Properties,” in which, based on the surveys that were carried out in FY2014 and FY2015, the following production techniques were introduced; metal ornaments, Tatara Iron Works, Japanese swords, ridge-end tiles, cypress bark roofs, handmade ramie threads, original yarns for Japanese musical instrument, Showa Village Karamushi-ori (ramie weaving), bark of hemp stalks, lacquer-tapping tools, Assam indigo, and shuttles for weaving. All the pictures were taken by Seiji SHIRONO who is a specialist staff member of the Institute’s Department of Art Research, Archives, and Information Systems. In the pictures, the right moment to clearly show the characteristics of the material and technique has been captured, producing optimal optical effects. The explanatory texts are written both in English and in Japanese. Copies of the calendar are delivered to foreign government ministries/agencies concerned with cultural properties in hopes to further deepen understanding among overseas people of Japanese culture and techniques to conserve cultural properties. The Japan Center for International Cooperation in Conservation conducts surveys of Selected Conservation Techniques and disseminates them overseas as traditional techniques protecting and supporting the cultural properties in Japan. In September 2015, we researched tapping Urushi and the manufacture of tools for tapping Urushi. Urushi (Japanese lacquer) trees used to be grown throughout the country for tapping. However, due to an increase in the number of relatively inexpensive Urushi produced overseas, the domestically produced Urushi available in Japan now accounts for only a few percent. The largest production area in Japan is Joboji Town, Ninohe City, Iwate Prefecture and its neighboring areas. From the beginning of the rainy season to autumn, around twenty skilled tappers annually collect Urushi from the trees. The conservation, handing-down and utilization of the techniques are being promoted mainly by the Japan Association for the Techniques to Tap Urushi. Uniquely shaped sickles, knife, spatulas and other tools are used for tapping Urushi. Their main parts are made from metal, and these tools are specially produced for tapping Urushi. 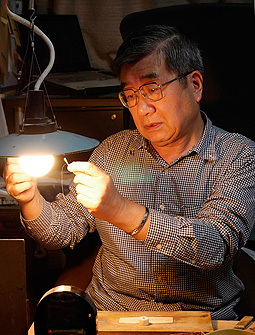 Mr. Fumitoshi Nakahata, who holds Selected Conservation Techniques to manufacture of tools for tapping Urushi, produces each tool by fine-tuning it according to the technical features of each tapper. Handing down the skills and techniques required for the manufacture of tools for topping Urushi is indispensable for the production and utilization of Urushi produced in Japan. The outcomes achieved in this survey will be finalized as a report, while the photos taken as visual data will be utilized as calendars for overseas. The Japan Center for International Cooperation in Conservation conducts surveys on the Selected Conservation Techniques and disseminates information about them to overseas as traditional techniques preserving and supporting Japanese cultural properties. In July 2015, we conducted surveys on the production of Silk thread for strings of traditional Japanese instrument, Cypress bark roof and Ramies in Showa Village. Shamisen and koto are traditional Japanese musical instruments, and indispensable for presenting Japanese traditional performing art such as Bunraku and Kabuki. Strings made of synthetic fibers are also used nowadays, however those made of silk are said to have the best tone. It goes without saying that such strings support the play and sounds of the instruments. 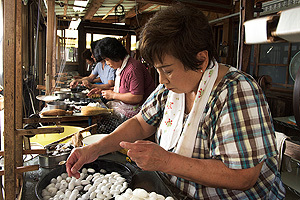 With the help of Association for Silk Thread for Strings of Traditional Japanese Musical Instruments, Kinomoto, in Shiga Prefecture, we conducted a survey on the process of zaguri (spinning silkworm cocoons into a thread). 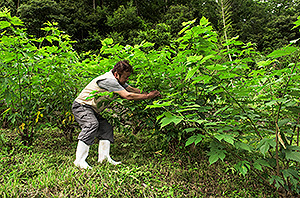 In recent years, the domestic sericultural industry has been declining, so the handing down of traditional techniques to later generations is becoming an important issue. 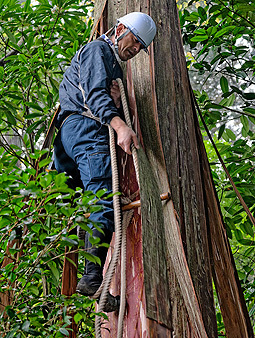 The cypress bark gathered from a standing tree has been traditionally used for roofing, and the technique has been used to build traditional temples and shrines. 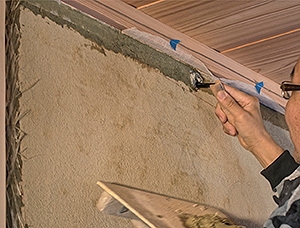 As such roof needs to be reroofed periodically, it is important to ensure good quality materials and to hand the technique down to later generations. Following a survey on the gathering of cypress bark conducted in October last year, we conducted a survey on the roofing at the Shotendo hall of Hozan-ji temple in Ikoma, Nara Prefecture, with the help of Tomoi Shaji Inc., a company belonging to Association for the Preservation of National Temple and Shrine Roof Construction Techniques, Inc..
Ojiya-chijimi and Echigo-jofu are textiles designated as the Important Intangible Cultural Properties under the Japanese law. These textiles are made from the ramie plant cultivated and processed in the village of Showa, Onuma District, Fukushima Prefecture. 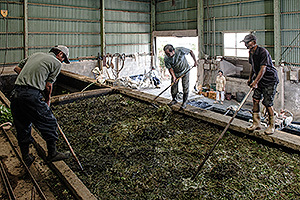 With the cooperation of Showa Village Association for Conservation of Karamushi Production Techniques and its members, we investigated the respective processes of gathering more than two-meter-high ramie plants, peeling the skin off, and extracting the fiber. Similar to other traditional craft industries, those engaged in the ramie production and processing have started to age, so training and developing successors and handing the technique down to later generations are becoming pressing issues. The results of the survey will be compiled in a report and we plan to make a calendar for overseas users. The Japan Center for International Cooperation in Conservation conducts surveys on Selected Conservation Techniques to present their information overseas as traditional techniques to protect and support Japanese cultural properties. In June 2015, we conducted surveys on Roof ornaments, Hand-spun ramie yarn in Miyako Island, Ryukyu indigo and Udagami handmade paper. 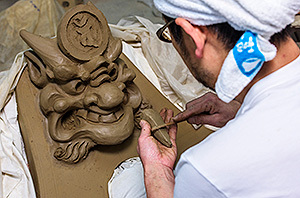 For the tiling roof of temples and shrines, several types of tiles and ornaments are used, and it is necessary to hand down the traditional advanced skills and the techniques that can be used depending on the purpose to later generations. With the cooperation of Yamamoto Kawara Kougyou Ltd. in Ikoma District, Nara Prefecture, we surveyed the production processes of onigawara roof ornaments and other products. 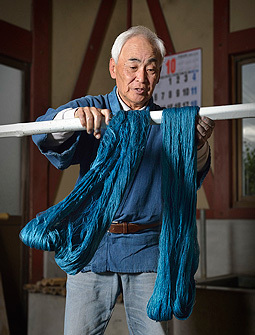 In Miyako Island, there is a traditional technique to extract the fibers of ramie and hand-spin them to make ramie yarn. 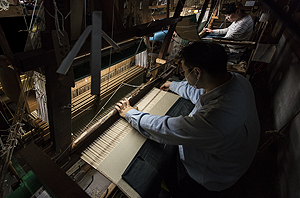 While it is an important technique for preserving and transferring Okinawa’s textile techniques including Miyako-Jofu designated as the Important Intangible Cultural Properties under the Japanese law, the ageing of skilled workers and training of their successors are becoming an urgent task. Ryukyu indigo, which is also used for Miyako-Jofu textiles, is a dyestuff using a different type of indigo used in the main island of Japan, and the main production area of the material is currently limited to the Izumi area of Motobu town on the main island of Okinawa, indicating how valuable such materials are. We also conducted a survey on the production process of traditional handmade Japanese paper using home-grown kozo plants (paper mulberry) at Fukunishi Washi Honpo in Yoshino District, Nara Prefecture. The Udagami paper of Yoshino is used mainly as the backing paper of hanging scrolls. It internationally receives high evaluation in the conservation and restoration of cultural properties such as calligraphies and paintings, and is widely used for such purposes. We will compile the results of the surveys in a report and produce a calendar for overseas. The Japan Center for International Cooperation in Conservation has conducted surveys of Selected Conservation Techniques. The Center interviews the technique holders, asking about topics such as their work process, the circumstances of their work, and how societal conditions are affecting them. SHIRONO Seiji (an artificer in the Department of Art Research, Archives, and Information Systems) photographed them at work, their tools, and other items. 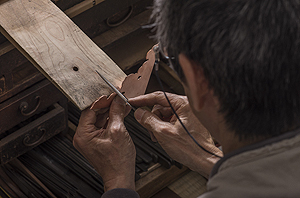 In April 2015, surveys on the making of ornamental metalwork., gold brocade, and loom shuttles were conducted in Kyoto. 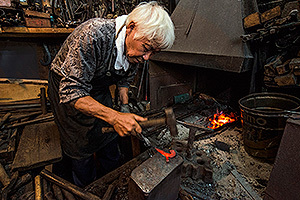 MORIMOTO Yasunosuke IV, the fourth-generation director of Morimoto Traditional Ornament Metalwork Co., Ltd., showed how to make ornamental metalwork and ritual decorations for temple and shrine buildings. Making ornamental metalwork involves a series of steps from shaping copper sheets to engraving a design, gold plating, and then finishing the metalwork. These processes were observed during this survey. At Hironobu Textiles Co., Ltd., which makes traditional textiles (such as gold brocade) for mounting, HIROSE Kenji discussed the current state of Nishijin textiles, and he showed how to make gold brocade by weaving gold thread into the weft of a fabric. A tool that is essential to weaving fabric is a loom shuttle, which is a wooden tool that is passed through a loom to weave the weft of a fabric. HASEGAWA Junichi makes loom shuttles. HASEGAWA explained the various types and uses of loom shuttles and he showed how he makes shuttles. Cultural properties need to be preserved, but the materials and techniques used to make those cultural properties also need to be preserved. The results of these surveys will be compiled in a report. In addition, plans are to create a calendar for overseas countries in order to publicize Japanese cultural properties and the materials and techniques used to create and preserve those properties. The Japan Center for International Cooperation in Conservation is studying Selected Conservation Techniques that must be preserved in order to preserve cultural properties. The center conducts interview surveys with the technique holders and the individuals from selected organizations, asking about their work process, the situation surrounding their work and their social environment and takes photographic records of them at work and their tools. 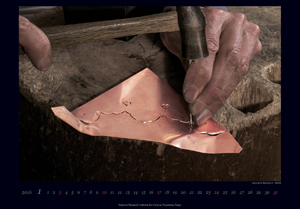 Two versions of a 2015 calendar (a wall hanging version and a desktop version) for overseas were produced to inform the public of these efforts and provide information. 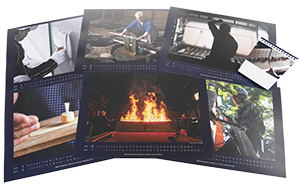 The calendar is entitled Traditional Japanese Technique to Conserve Cultural Properties and it covers production of Japanese paper, production of sukisu bamboo screens for papermaking, plastering, dyeing with natural Japanese indigo, gathering Japanese cypress bark, Tatara smelting, and production of brushes for makie from among topics studied in 2014. All of the photographs were taken by SHIRONO Seiji of the Institute’s Department of Art Research, Archives, and Information Systems. These visually stunning images capture an instant highlighting the aspects of traditional materials and techniques, and explanations of each photograph are provided in English and Japanese. 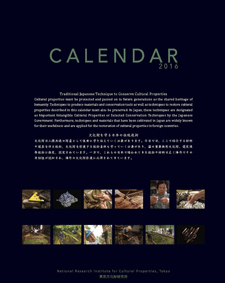 The calendar will be distributed to foreign agencies and organizations dealing with cultural properties to promote of understanding of Japanese techniques to conserve cultural properties and Japanese culture. Following on from last month, the Japan Center for International Cooperation in Conservation is continuing to investigate of Selected Conservation Techniques. The center conducts interview surveys with technique holders, asking about topics such as their work process, the situation surrounding their work, and their social environment, and takes photographic records of them at work, their tools, and other items. In November 2014, surveys and documentation activities were conducted regarding Ryukyu indigo production in Okinawa, production of sukisu bamboo screens for papermaking in Ehime, and a sakan (plaster work) in Tokyo were studied and recorded. 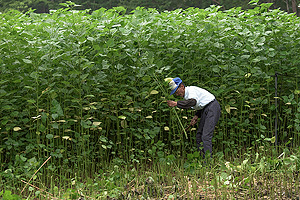 Ryukyu indigo differs from other types of indigo plants on the main island of Japan. 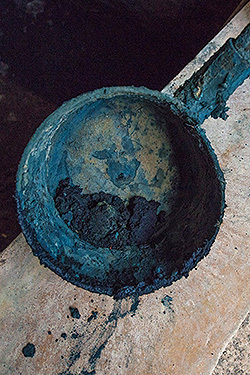 The processes of cultivating and manufacturing Ryukyu indigo also differ substantially from those used in indigo dyeing with tade-ai (Chinese indigo). 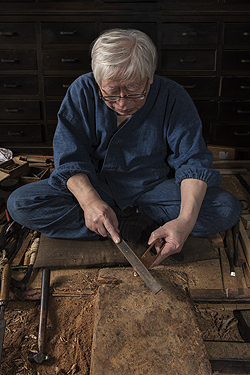 Mr. INOHA Seisho is a holder of Selected Conservation Techniques, and Mr. NAKANISHI Toshio who is carrying on INOHA’s techniques. Mr. NAKANISHI explained that recent typhoons and inclement weather have affected the growth of Ryukyu indigo. Mr. NAKANISHI also described the process of manufacturing indigo. 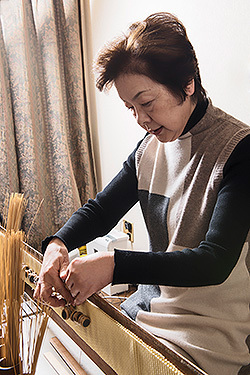 Ms. IHARA Keiko is a member of the National Society to Preserve Tools and Techniques Used to Produce Japanese Paper by Hand who lives in Ehime. Ms. IHARA is also certified as a traditional craftsperson by Ehime Prefecture. Ms. IHARA talked about the current state of sukisu screen production, procurement of bamboo strips and silk thread to make those screens, and the difficulty of training a successor. The company Nakashimasakan was working at a site in Tokyo where a traditional building was being restored. Part of sakan (plaster work) done by the company was photographed. Relating sakan (plaster work), Japanese wall, National Cultural Property Wall Technical Preservation Meeting is certified as a group holder of Selected Conservation Techniques. Cultural properties obviously need to be preserved, but the materials and techniques used to craft those cultural properties also need to be preserved. The research materials from this study will be compiled. In addition, plans are showcase some of these materials overseas. A calendar with visually stunning images could be used to highlight the nature of Japan’s cultural properties, how those cultural properties are created, and materials and techniques that need to be preserved. Cultural properties must be protected and passed on to future generations as the shared heritage of humanity. If the materials and tools for producing cultural properties, and the techniques for restoring them, are not handed down and used, it will be impossible to keep cultural properties in good condition. Japanese conservation and restoration techniques for cultural properties are recognized for their usefulness and used in practice, even outside Japan. Traditional techniques that are essential for preserving cultural properties, and must themselves be conserved, have been selected by the Minister of Education, Culture, Sports, Science and Technology as Selected Conservation Techniques. Individuals and groups possessing such techniques (holders) are also certified. At present, 71 techniques have been certified, as well as 57 individual and 31 group holders. The Japanese Center for International Cooperation in Conservation carries out studies relating to Selected Conservation Techniques, and widely disseminates information both inside and outside Japan. The center conducts interview surveys with technique holders, asking about topics such as their work process, the situation surrounding their work, and their social environment, and takes photographic records of them at work, their tools, and other items. 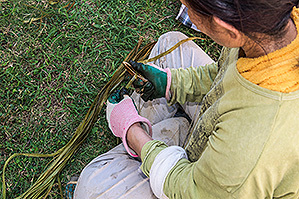 In October 2014, surveys and documentation activities were conducted regarding production of brushes for Makie by Mr. MURATA Shigeyuki at the Murata Kurobei Shoten in Kyoto, dyeing with natural Japanese indigo by Mr. MORI Yoshio at Konku in Shiga, and gathering of Japanese cypress bark by Mr. ONO Koji at Awaga Shrine in Hyogo. 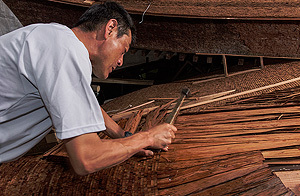 The three cases investigated were traditional, specialized techniques in three different fields (lacquer, dyeing and architecture), but the point of commonality is that all of these individuals are keeping traditions alive through intelligence and skill—working earnestly with natural materials, and coping with changes in the environment. The results obtained through these surveys will be accumulated and used as research materials on cultural properties. 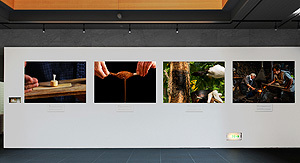 At the same time, by distributing media overseas such as calendars incorporating images with high visual impact, we plan to internationally disseminate information on the nature of Japanese culture, and on materials/techniques for creating and conserving cultural properties.